BIRDIES, BOGEYS, BBQ & BOURBON TOURNAMENT’!! Come join us for our FIRST annual ‘BIRDIES, BOGEYS, BBQ & BOURBON TOURNAMENT’!! All the fun takes place on September 29th, 2018 at the beautiful Rockway Vineyards Golf Course. Entry is only $110 per golfer which includes 18 holes with cart, lunch on course, chicken and rib dinner + PRIZES! Pig Roast on the Patio! * WHAT A GREAT TIME THIS WAS!! Come and celebrate the long weekend with us! We will have a whole hog on the spit outside on the patio slow cooking all day! Country 89 will be there with their truck/trailer and giveaway swag and the Fenwick Lions Club will be there selling tickets for their Classic Car Giveaway (the ‘66 Malibu will be on-site as well)! We will also have chances to win some prizes and will be doing a scavenger hunt in Port Dalhousie which should be tonnes of fun! Most importantly… our full menu is still available and the drinks will be very COLD!! 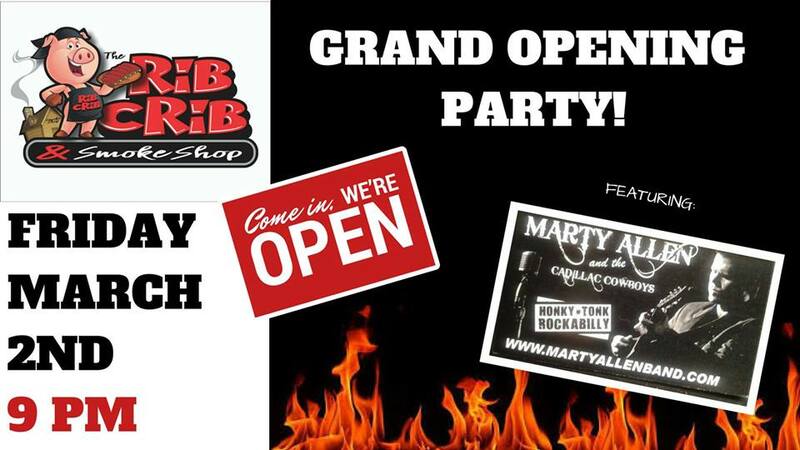 Rib Crib Grand Opening Party! * THANKS TO ALL WHO MADE THIS NIGHT AMAZING! Come on out and celebrate our Grand Opening with us! Join us for dinner to try out some of our amazing authentic BBQ, then stick around for some drinks, giveaways and live music from the Marty Allen Band! We are really looking forward to celebrating with all of you!